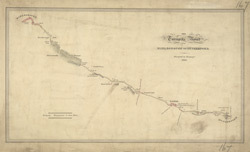 Records from the Ordnance Survey Letter Book suggest that Edmund Crocker surveyed the turnpike road from Hungerford to Marlborough and William Stanley, draughtsman, made the drawing. The road is coloured yellow ochre and one side is thickened to indicate its importance. Notes of mileage in ink figures appear alongside the road. The close attention given to communication routes highlights the military emphasis of these studies.